Santa's Surprise Is Ending Soon! 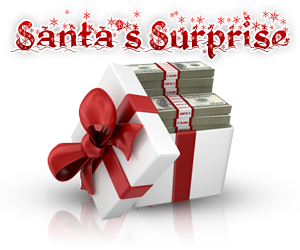 If you have played this month then you know how rewarding Santa's Surprise has been for our members. We aren't slowing down for the rest of the year with tons more rewards coming. We are kicking it up a notch by letting our members know what the promotions are below. Our little way of saying thank you for everything. Fly Casino opened its doors in 2013 and I cannot tell you how proud of it I am. Our staff has put endless hours of hard work into Fly with the intention of providing a truly Elevated Gaming Experience. From the feedback of our members we believe that this is noticed and appreciated. We will not stop now, our mission is to provide every single member an amazing experience and if you think 2013 was a blast…just wait till 2014. From all of us at Fly Casino, thank you so much for choosing us as our gaming entertainment location. We are honored to serve you. 15% CASH BACK! All Fly members with a total NET CASH DEPOSITS of $50 or more during lost December 31st. may claim 15% cashback on loses. Provide your username to support@Flycasino.com by January 1st, 2014. Simply put in the subject line: "15% Cash Back". Our support team will review and then credit your gaming account 15% cashback up to $300 for your net DEPOSIT loses within 24 hours.